“The man bowed his head and worshiped the Lord and said, ‘Blessed be the Lord, the God of my master Abraham, who has not forsaken his steadfast love and his faithfulness toward my master. As for me, the Lord has led me in the way to the house of my master’s kinsmen’” (Gen. 24:26–27). Yesterday, we saw some evidence for what John Chrysostom, the gifted fifth-century bishop of Constantinople, called Rebekah’s “enthusiasm for hospitality” (Homilies on Genesis, 48.19). All of us do well to follow her example, because that stranger or guest at our door might just be an angel in disguise (Heb. 13:2). Matthew Henry notes in his commentary how Rebekah was brought into Christ’s lineage by this act. Because of her hospitality, she would marry Isaac and give birth to Jacob, the forefather of Christ (Gen. 24:67; 25:19–28; Matt. 1:1–17). We will not share this honor; nevertheless, this blessing to Rebekah should remind us of what God may give us for one seemingly insignificant act of kindness. After all, Jesus does promise to bless those who give his people one cup of cold water (10:40–42). We who claim to worship the Savior should be the most hospitable of people, not only because the Lord commands it, but also because care for the sojourner will be rewarded (see also Lev. 19:33–34). Rebekah continues her service to Abraham’s servant in today’s passage. She offers him lodging for the night (Gen. 24:25) and is quick to tell her household of what has transpired (v. 28). Notably, the servant learns her familial ties. Rebekah’s grandmother Milcah is the daughter of Haran, Abraham’s brother. Milcah married her uncle Nahor, Abraham’s other brother. Rebekah, the daughter of Bethuel, is a direct descendant of Abraham’s siblings and the patriarch’s (great) niece (see 11:27–29; 24:24). This beautiful maiden meets the criteria Abraham laid down for Isaac’s wife (24:2–4). Success may cause some to become puffed up with pride, but the patriarch’s servant, as a follower of the Lord, only reacts with humility. 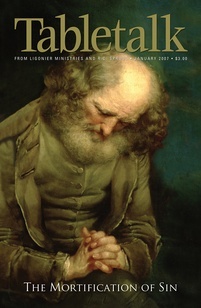 He bows his head and worships, the combination of the repetitive terms “bow” and “worship” indicating that He is overwhelmed by God’s answer to His prayer (vv. 26–27). Having looked for the Almighty’s hand, and seeing how the Lord has come through for him, Abraham’s servant can only respond in deep gratitude to God, which is the only way believers can respond to His care. We are good at asking the Lord to give us certain things, but are we equally adept at thanking Him when He answers our prayers? Perhaps one reason why we forget to worship Him for His blessings is that we forget God’s work on our behalf in normal, every-day life. When we go about our business, let us be ever searching for ways to thank the Lord for the little things He gives us every day. When a blessing comes your way, stop and worship Him.